Flake food is any foodstuffs suitable for use with fish that has been processed into thin layers or flakes which float on the surface of the water. It is produced by mixing the chosen ingredients together in large vats and then baking the resultant sludge until it has lost almost all of its moisture and begins to flake away into thin layers. Various ingredients are used and there are many variants of flake food formulated for different fish types, i.e Cichlid flakes, pond flakes etc. 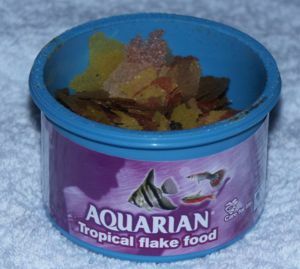 Flake food is probably the most popular food fed to fish throughout the world. It is cheap and found in all pet shops and even the local supermarket or corner shop. However flake food is a soft, messy food and tends to float for a short time before it sinks and breaks apart into tiny fragments. Most fish will spit out a large flake to break it up and so most of a flake tends to go to waste. The product is however easily crumbled into smaller pieces for your small fish. The different colours of the flake food indicate different foods. Green is typically an algae like spirulina, red is shrimp, others may be white fish flesh. Some flake foods contain colour enhancers and may contain health booster chemicals. The quality of flake food varies enormously. Some companies sell basic flake food and some sell 'premium' flake food with claims that their product contains only the best ingredients. Such is the state of the flake food industry. Basically you get what you pay for. Fish and fish derivatives, Cereals, Derivatives of vegetable origin, Oils and fats, Algae, vegetables,Minerals, Molluscs and crustaceans, Egg and egg derivatives,Yeast, EEC permitted antioxidants and preservatives. Flake food comes sealed against the air and light. This is because the food is highly processed and the artificial vitamins in it are easily destroyed if exposed to heat, light or oxygen. The product will have a 'best-before' date on it (typically 2 years) and this should be noted that this is for the food in the sealed condition. Once unsealed the product's vitamins will rapidly lose their nutritional value. The product should be disposed off after 3 months. Keep in the refrigerator if you wish it to last 6 months. Be wary of flake food sold in see-through packaging as light damages the flake. Also normal transparent plastic lets moisture slowly through. This page was last edited on 14 February 2011, at 02:50.